The six-month-old son of Elizabeth and James Massey died this date, January 2nd, in 1854 and was buried at Bethel Burying Ground. 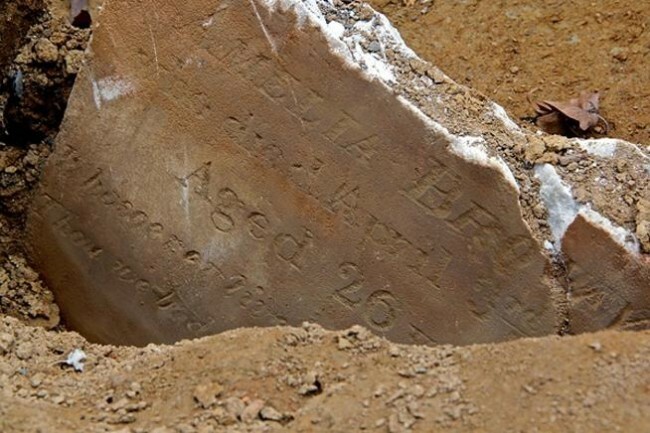 The above Death Certificate is extremely faded but states that the six-month-old son of Elizabeth and James Massey died this date, January 2nd, in 1854 of swelling of the brain (“Dropsy”) and was buried at Bethel Burying Ground. James (34 y/o) was employed as a coachman and Elizabeth (29 y/o) as a laundress. He was born in Maryland and she was born in Pennsylvania. According to the 1847 Philadelphia African American Census, they had a male child under the age of five years old. In the 1850 Federal Census, this child is no longer reported and presumably had died during that time period. The family lived at 14 Burd’s Court in a small room for which they paid $3.33 a month. The narrow block-long thoroughfare was near 10th and Spruce Streets in center city Philadelphia. From the available census records, it is apparent that Mr. Massey was a public hack driver as opposed to a private driver who is employed by a wealthy family and also has domestic duties in the family’s home, such as being a butler. Public drivers are divided into those that own their horse and carriage and those that work for a company that operates coaches, much like the taxi companies of today. Mr. Massey likely would have been the latter. The 1847 African American Census lists 106 Black men employed as coachmen. Elizabeth Massey worked as a laundress. A job that taxed her body and spirit. Water had to be drawn and carried from the nearest hydrant, firewood had to be obtained, fires had to be started and heavy bundles of clothes had to be picked up and returned to her customers after the clothes and sheets were hung up, dried and folded. All this in the heat and cold, while taking care of children and shopping for and preparing the family’s meals, often while pregnant. It was an undertaking for only the strong and strong-willed. After 1854, Elizabeth and James Massey disappear from public records. Their child died of swelling on the brain from either Meningitis or Encephalitis. The adults may also have succumbed to the infection, although there are no surviving death certificates on record of that occurring.